Reviewing my past year with uterine (endometrial) cancer, I am grateful for and thank everyone for their support. Also wishing my sisters with all gynecologic and breast cancers the very best this fall season. October 10, 2013: A year ago today, my reading group met to discuss The Book Thief by Markus Zusak, which was soon released as a movie. It was a remarkable story supposedly written for a “young adult” audience. I guess all of the women in my group consider ourselves to be in this category because we were mesmerized by this tale of life narrated by Death. Set in WWII Germany, the land of most of my ancestors, it is ultimately a triumph of the human spirit, flailed as it was—and is for us all—by circumstances beyond our individual control. October 12, 2013: Our family had its annual Oktoberfest at our house, an event that started in 2009 after we were reunited with my sister after 50 years. October 15, 2013: I had a pelvic ultrasound—finally!—after having non-stop, but light, vaginal bleeding since about September 1. Six weeks was too long to wait, but I had had this in the past. The study showed a very thickened uterine lining (endometrial hyperplasia). After first suggesting that I have a D&C (dilatation and curettage) within a couple of months, my gynecologist called back and said maybe I should have the procedure done sooner. October 24, 2013: I had a pre-op visit with my GYN. We had done this a few years ago. Neither of us seemed too concerned. I joked that as long as I was under anesthesia, he could do anything (medical) he wanted to me. I just love that twilight sleep. October 28, 2013: I had the D&C done at the local surgicenter as an outpatient and went home to rest. A disaster of comical but infuriating proportions greeted me when I returned home, but my husband would kill me if I told you what happened. Just a tip—airport-grade driveway crack filler should not be brought indoors, especially into the kitchen, and . . .
November 4, 2013: One week later, my gynecologist called to say, “We’re not done with you yet.” He wanted me to come into his office right away. And he told me why: the pathology report showed endometrial adenocarcinoma—uterine cancer. We had to discuss surgery, and I needed to choose a doctor. Hunterdon County, upscale as it is, does not offer advanced medical services. 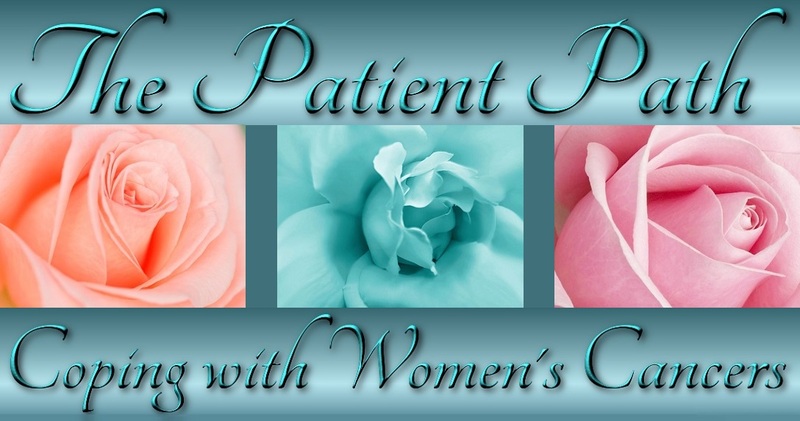 November 9, 2013: I started The Patient Path. The purpose and mission are stated here. The ribbon color signifying uterine cancer is peach, as teal is for ovarian and gynecologic cancers and pink is for breast cancer. 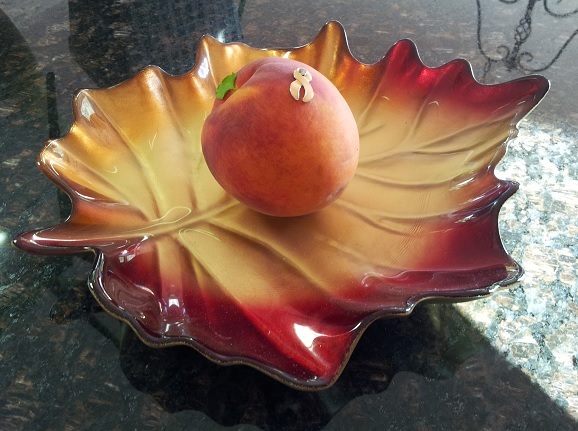 The whole story of how I became an “autumn peach” over the past year is here. Amazed as I am that I have filled the blog with content about uterine cancer and a number of other topics, I still have much more to say about many things. For today, I just wanted to acknowledge all the women who have had or have uterine cancer—especially if they have just been diagnosed. If this describes you, I hope you will find lots of good information and support within these blog pages. As I approach the end of my first year of a new personal reality, I am reflecting on how some of it has been stark, much of it has been beneficial, all of it has been eye opening. Most days, I feel more awake. Please keep your own open eyes on this space for more. And please be in touch. Best wishes to all of the autumn—and winter, spring, and summer—peaches out there!